"We have just seen the premiere of what may well be the great American opera. . . What happens in Act II constitutes one of the most powerfully moving scenes in all opera . . . [Brown’s] hubris, his martyrdom, and his apotheosis bring this character and events from the historical into the pantheon of the great tragic figures in theatre." For technical reasons, some excerpts from the premiere production could not be used. 3 Martha’s brother has been killed by the Invaders. When the territorial Governor tells her that “Kansas Law” does not permit such action, she sings this aria. 4 “When I was a boy.” Brown’s aria is sung to a slave who asks why he, alone among his race, is willing to die to free slaves. 5 In 1848 Brown helped a slave family to escape. The husband and chorus sing “Dan-u-el,” a spirtual that combines an old text with new words and music. 7 “Dear Husband.” One of Brown’s men at Harpers Ferry was a freed slave who hoped to free his wife and children, still in slavery a few miles away. His wife, seen as his vision, sings her actual letter. The husband was killed in the raid. 8 Brown’s family and friends ask Douglass for the famous speech he made in England. The words are drawn from his speeches and autobiography spanning many years. It leads directly into . . .
9 Declaration. “What do we want of America?” Douglass asks and he is joined by the chorus in the beginning of the Declaration of Independence. “Why write an opera about John Brown? Wasn’t he some kind of violent nut?” This is a question I often hear from people who know little about United States history and less about opera. 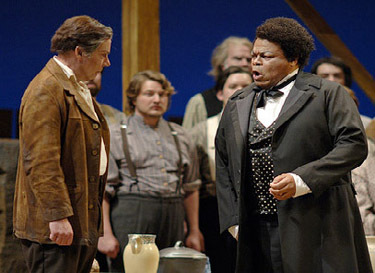 John Brown was like an Old Testament prophet reincarnated as the quintessential American of the nineteenth century, a larger-than-life figure ideal for opera. Operas are not about “nice guys.” They are about charismatic men and women whose passions and actions invite controversy and conflict. Since 1776 America has had special meaning for the rest of the world. Despite its flaws it has become a symbol of equality and justice for all races and religions. From the beginning, however, there was a cancer within — slavery — the exact opposite of everything the country stood for. Brown hated it with a passion. His story is the battle for survival of the American vision; it remains an inspiration both to other peoples and to those Americans who still must struggle for simple justice. Brown’s Old Testament message was this: you cannot have both injustice and peace. This proved to be an accurate prophecy: it took a national cataclysm to end slavery, and the world is still fighting over racial issues. A malicious myth about John Brown persists in some quarters: that he was insane or at the very least a wild fanatic. Emerson and Thoreau didn’t think so, and they knew him well. So did Frederick Douglass, who saw in Brown “a truly great soul.” Victor Hugo, Walt Whitman, and later, Theodore Roosevelt, W. E. B. DuBois and Carl Sandburg — all wrote tributes to Brown. I have tried in my libretto to be historically accurate. It is absolutely essential to see Brown in the context of his time in order to understand the man, and to understand the Civil War. I grew up in Kansas (my father was the state historian) and the truth of this story is important to me. I spent a year doing research, consulting with the foremost authority on Brown, the prize-winning historian Stephen B. Oates, before, during and after writing the libretto. Oates has “sought to show why Brown performed his controversial deeds rather than to damn or praise him.” I follow his example and hope that the addition of music will bring this drama to life in a new and cathartic way. For all my concern with history and drama, I am acutely aware that an opera lives or dies by the quality of its music. Here I gladly give up words and turn over the consideration of that enigmatic and timeless old man to the hearts and minds of my listeners.